Coconuts – by Karin Jnr. I opened coconuts. There is this niche where three coconut trees grow. They are out of the way, sort of on the edge of the jungle, so their coconuts weren’t harvested early to keep the population safe. ( Falling Coconuts have caused more deaths than sharks). The first time I found a coconut I decided to try and open it on my own. I did so with the help of a screw driver and a really big mean pocket knife I was once given by a friend for my birthday. It’s not easy opening a coconut. I have found the best way to do it –after doing this a couple of times now- is to peel the husk off of the middle brown bit. To do this I stick the knife in until it hits the hard bit in the middle. I then cut a line, from the top to the bottom. I then stick in the screwdriver and lever the husk off piece by piece. This takes ten to fifteen minutes. The coconut – to those of you who have never been privileged to see an actual real one – husk and all, has three little sensitive bits. These are sort of positioned like a bowling ball’s three finger holes. They are thinner and weaker bits of… shell. I cut these away with my knife. But before I can actually drink the coconut juice or whatever you want to call it, there is a layer of coconut between me and the juice. I scoop this out with my knife and eat it. There are these little white things just inside the holes, I assume they’re the seeds. I always eat them. So if you see a coconut coming out of my ear, you’ll know where that came from. I know there are better and more efficient ways of opening coconuts, but I find my way fun. I tried using a normal knife once, but it bent like butter. 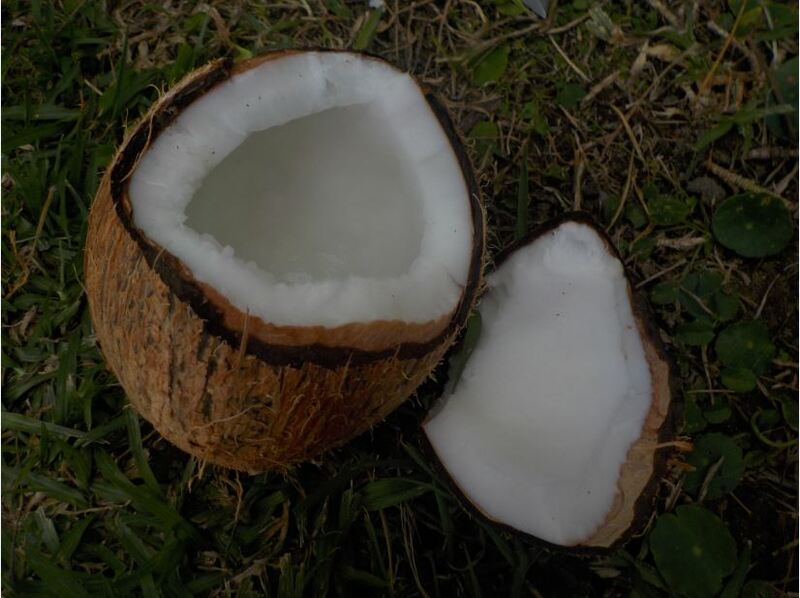 This was because I sort of also sometimes use the knife to cut the husk pieces closer to the brown centre part of the coconut, as a kind of lever … So now we have a designated knife called the coconut knife, due to its rather bendy form. My fault entirely, but hey, it’s an interesting story. Sort of. Oh, and another thing. Don’t try eating a rotten coconut. I found this coconut, but I wasn’t sure if it was still good. The husk was still mostly green on the outside, but some of it had gone brown. I decided to open it and check for myself. It looked fine and all. Some parts of the husk didn’t smell that nice any more and were a little damp, but I figured the milk is in the inside of the nut right? I scooped out the piece of coconut and put it in my mouth, sniffing it first like a monkey. I don’t have a monkey’s sense of smell and I thought the slight rotten smell might just be my hand from dealing with the husk. It was probably part of it, but not all. Believe me, Rotten coconuts do not taste nice, at all. Oh, but I never mentioned the eating of the Coconut. The white stuff, not the whole thing. After you’ve drained the juice/milk or whatever out of the… shell. You throw the brown cup-ish thing on the cement ground very hard. Till you create a crack in it. Then you lever it open with your pocket knife and break off pieces to share with all your siblings. But this is a hard part, for there is only one pocket knife, and now it is in high demand because everyone wants to use it to help them separate the bit you eat from the bit you don’t. There, this blog post is complete. That’s a tough job. We got fresh coconuts in Fiji and although we like coconut we don’t like coconut water,!